Cutter and Buck Epic Easy Care Fine Twill Long Sleeve Shirt Distinguished quality with easy care... what more could you ask for? 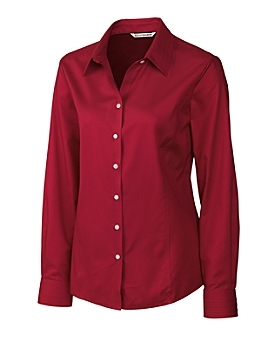 This shirt has the rich feel of a cotton blend plus a wrinkle-reistent finish. You will feel draped in a relaxed fit that's roomy and works well whether dressed up or down. It features a button-down collar and patch pocket; the back box pleat offers room to move; and its finished with two-button adjustable cuffs, button-sleeve plackets and shirttail hem. A C&B pennant accents the left cuff. 60% cotton, 40% polyester. Machine wash/dry clean. Imported.